Chilean director Sebastián Lelio broke into the international film scene with his Best Foreign Film Oscar nominee GLORIA back in 2013. His latest hit, already critically acclaimed since its debut at Cannes also deals with a female protagonist, actually a transgender heroine, played astonishingly by Daniela Vega. If nominated for a Best Actress Oscar she will make headlines as the first transgender to get nominated in the Best Actress Oscar category. Lelio’s camera loves her. And she is very good in the role too. And very beautiful! A FANTASTIC WOMAN is the portrait of a woman adrift. Marina (Vega), the FANTASTIC WOMAN of the title is beautiful, enigmatic, and plunged into a precarious situation after her older boyfriend dies unexpectedly in her company. Her world is turned upside down. She has to come to terms not only of her loss but with the horrid prejudice of his family. Fifty-seven-year-old divorcé Orlando (Francisco Reyes) wakes in the middle of the night, suffers an aneurism, and falls down some stairs. He sustains injuries that will come to haunt Marina after she takes him to the hospital and attempts to slip away before authorities and family members begin prying. Marina knows she’s regarded with suspicion for her youth, class, and, above all, gender status. She experiences the viciousness of Orlando’s son, the cold-heartedness of Orlando’s ex-wife, and the intrusiveness of a detective from the Sexual Offences Investigation Unit force Marina to not only clear her name, but also to demand the very thing no one seems willing to give her: respect. The saddest segment is when she is denied the human right to say goodbye to the dead Orlando. She is chased out of the funeral church service by her family. The events are also put into a different perspective from Marina’s sister and her husband, who reluctantly offer to help. At least they realize that it is the right thing to do. The film is shot in Santiago, though the touristy sights are not seen. The film is accompanied by sombre music when it needs to and uplifting music at other times. Lelio’s film contains both disturbing scenes and scenes of elation. The ones most difficult to watch are understandably those involving abuse to Marina. Marina is picked up and forced into a car by Orlando’s brother and family, beaten, taped up and then tossed out of the car. Marina at one point, goes dancing to forget her troubles. In a fantasy sequence, she dances wearing sparkling top together with those dancing around her. Marina finally sums up her courage to do what is right – to see her lover, Orlando one last time before he is cremated. 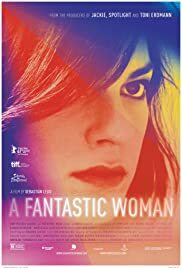 A FANTASTIC WOMAN is both a sad and uplifting film that illustrates the old adage that something that will not kill you will make you stronger.